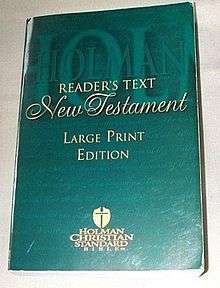 The Holman Christian Standard Bible (HCSB) is a modern English Bible translation from Holman Bible Publishers. The first full edition was completed in March 2004, with the New Testament alone having been previously published in 1999. The roots of the HCSB can be traced back as early as 1984, when Arthur Farstad, general editor of the New King James Version of the Bible, began a new independent translation project. In 1998, Farstad and LifeWay Christian Resources (the publishing arm of the Southern Baptist Convention) came to an agreement that would allow LifeWay to fund and publish the completed work. Farstad died shortly thereafter, and leadership of the editorial team was turned over to Dr. Edwin Blum, who had been an integral part of the team. The death of Farstad resulted in a change in the Greek New Testament text underlying the HCSB, although Farstad had envisioned basing the new translation on the same texts used for the original King James Version and New King James Version. He followed the Greek Majority Text which he and Zane C. Hodges had authored. After Farstad's death, the editorial team replaced this text with the Greek New Testament as established by twentieth-century scholars. The editions of the United Bible Societies and of Nestle-Aland's Novum Testamentum Graece were those primarily utilized, along with readings from other ancient manuscripts when the translators felt the original meaning was not clearly conveyed by either of the primary Greek New Testament editions. Holman Bible Publishers assembled an international, interdenominational team of 100 scholars and proofreaders, all of whom were committed to biblical inerrancy. The translation committee sought to strike a balance between the two prevailing philosophies of Bible translation: formal equivalence (literal, "word-for-word", etc.) and dynamic or functional equivalence ("thought-for-thought"). The translators called this balance "optimal equivalence." According to the translators, the primary goal of an optimal equivalence translation is "to convey a sense of the original text with as much clarity as possible". To that end, the ancient source texts were exhaustively scrutinized at every level (word, phrase, clause, sentence, discourse) to determine its original meaning and intention. Afterwards, using the best language tools available, the semantic and linguistic equivalents were translated into as readable a text as possible. Making use of the most recent scholarly traditions, the translators worked from the Nestle-Aland Novum Testamentum Graece, 27th edition, and the United Bible Societies' Greek New Testament, 4th corrected edition (for the New Testament), and the 5th edition of the Biblia Hebraica Stuttgartensia (for the Old Testament). In the case of significant differences among Hebrew and Aramaic manuscripts of the OT or among Greek manuscripts of the NT, the translators followed what they believed was the original reading and indicated the main alternative(s) in footnotes. There are a few places in the NT that the translation team and most biblical scholars today believe were not part of the original text. However, these texts were retained (and indicated in large square brackets) because of their undeniable antiquity and their value for tradition and the history of NT interpretation in the church. The HCSB is available now in electronic form for WORDsearch and Bible Explorer software. An HCSB Study Bible became available in October 2010. The HCSB is available online and is also being marketed in Christian publications as an Apologetics Bible and as a version specifically for the Microsoft Xbox 360 called Bible Navigator X. The HCSB was updated in 2010. The most significant change was an increase in places where the covenant name of God, known as the tetragrammaton, was transliterated as "Yahweh," rather than translated as "LORD." In the first edition Yahweh was found in 78 places; the update raised that to 495 instances. (The tetragrammaton appears in over 6,800 places in the Hebrew Bible.) Text editions began rolling out in 2010. In June 2016 B&H Publishing announced a major revision of the translation that will be called simply the Christian Standard Bible (CSB). Products utilizing the CSB text are scheduled to begin appearing in March 2017. ↑ Called by the translators "optimal equivalence", the translation is a mediating translation in the stream of the NIV and similar, but slightly more literal. wordsearchbible.com Holman Christian Standard Bible (HCSB) Archived February 16, 2008, at the Wayback Machine. ↑ Dewey, David, 2004. A User's Guide to Bible Translations (Downers Grove, IL: Intervarsity Press, 2004). ISBN 0-8308-3273-4. ↑ "The Bible is God's revelation to man ... it is God's inspired Word, inerrant in the original manuscripts." From 'Introduction' to the HCSB. Text of the 'Introduction' also at BibleGateway.com. ↑ Edwards, ElShaddai. He is Sufficient. "HCSB: 2nd Edition text available." Copyright 2007-2009 ElShaddai Edwards, retrieved July 25, 2009. ↑ This Lamp Blog. Retrieved December 31, 2009. ↑ http://biblia.com/books/hcsb/, https://www.mywsb.com/reader. Retrieved March 8, 2016. ↑ "Bible Navigator X". bhpublishinggroup.com. ↑ Gillis, John W., MaybeToday.org. "The HCSB 2nd Edition and the Tetragrammaton." Copyright 2008-2009 MaybeToday.org. Retrieved July 25, 2009.